I believe The Self Sufficient Gardener has been reprinted fairly recently and is still available. If you come across a copy in your gran’s cupboard, snaffle it up. If there is a copy in a second hand bookstore, bargain for it. The reason for the book inclusion in this newsletter is to look at his advice on planting onions and leeks. As the weather turns cooler, I always think of the Allium family, which the onions and leeks are part of. They thrive in the cool weather, and are possible to grow throughout Australia. You just need to choose the right variety for the season and the climate. My favourites are Giant Caretan Leeks pictured above. John suggests Musselburg, another heirloom variety. They can last in the ground for 12 months or longer as they thicken their stems. Start eating them when they are about 2cm thick. Onions will sit in the ground all winter, growing their bulb. Don’t expect a quick result from your onion crop. John suggests spring onions for warm weather. In fact, I grow spring onions all year round in our garden. They are quick to produce a crop. I have them in the raised bed with the berries to fill the ground space and have them growing under the climbing roses for aphid control. have a red stem and bulb and add colour to salads. · I’ve had success with Red Salad Onions in the subtropics too. I find if they go in during Spring, we can eat them through the summer whereas brown and white onions already finished in the hotter weather. · For cooler climates and winter in the subtropics, try Gladalan brown onions and Spanish White. I’d even try planting them now in Victoria, putting the seed into pots then transplanting out as they grow 10-15 cm tall. · In the warmer regions, Green Harvest suggests planting Lockyer Brown and Lockyer Gold up until May. Plant onion seeds in autumn, and seedlings in autumn through to late winter. 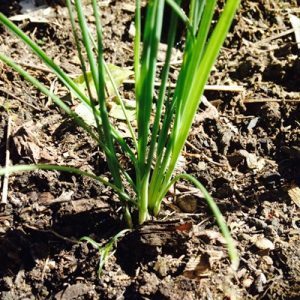 Leeks and spring onions can go in as seed or seedling throughout the year in the subtropics, and in spring or summer in cooler climates. Leeks and onions need a pH of about 6-8. I add crushed wood ashes. Just a sprinkle. This regulates acid soils but also add potassium that the onion family love so much. Leeks sown as seed directly into beds will need thinning once they grow large enough to handle. If you have some old manure in a heap or bucket in the garden, add some to the soil as well. However, a good rotation is to put in the onion family after potatoes as the soil will be fertile and loamy and you may not need to add any further manure at the time of planting your onions or leeks. I find leeks are more forgiving of poor soils, so if you’re just starting a garden and still improving your soil, try leeks first. I usually plant onion seeds in autumn into small 90 cm pots of rich Searles Organic Kickalong potting mix. I find them easier to keep an eye on and keep moist as they grow. The young leaves are so fine! I then transplant them when the leaves are about 10-15 cm long. This will be about 2 months after sowing. Leeks and spring onions are treated the same way. Extra long roots can be trimmed with sharp scissors a little for ease of planting. While some people also trim the leaves, I don’t bother. Leeks planted in the ground as seed will need to be thinned out to individual plants. The picture above right shows them at the stage of needing to be thinned and transplanted. If you have a good loamy soil, rich in organic matter and old manures, John suggests planting the onion or leek seed in rows directly into the soil about 2 cm deep. A hard crusting clay will not allow the germinating seed leaves to break through the soil. I make a long trench with a trowel, mounding the soil up on one side. I lay the onions or leeks on the lower side of the trench about 5 cm apart then come back with the trowel and cover the white part of the seedling. Firm them in. The leeks or onions will stand up straight in a few days. Your onion or leek crop is pretty care free. Just keep the bed weed free and moist. Spring onions are going to seed. 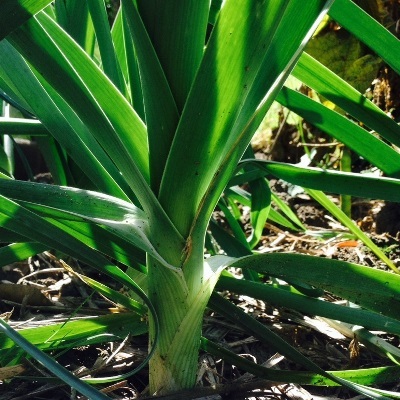 John suggests Leek seeds last about 4 years stored in cool dry conditions. I save seed from each crop and dry it before storing. I don’t always have enough for my sowing needs, but Green Harvest and Eden or Select Organic can provide you with seed if needed. The plants will go to seed after about 12 months in the ground. 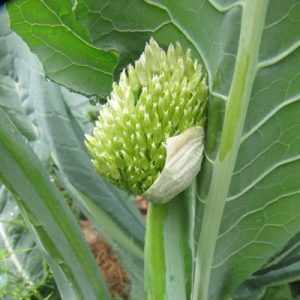 If you want your leeks to last longer, carefully prick off the flower stems when very young to keep the leek growing longer. Otherwise, leaving the best specimens to flower will mean you can wait til they dry then collect the seed for next season. There are so many claims to fame for onions, leeks etc, that really, they could do anything from curing cancer to overcoming bloating and blood pressure. My Scots friend used to say her mum tied an onion to her feet when she had a cold. I haven’t tried that one. My mum says that a boiled onion always cures constipation. My Sri Lankan friend says they are good to reduce high blood sugar in diabetics. I just reckon we can’t do without them in our recipes, so get in there and grow your own!